A skeleton squad saw Prestwich put in an incredibly disciplined hard working performance to take all the points from their hosts sat comfortably in the leading pack. Burnley started strongly and Prestwich had to stay solid and compact to keep them at bay, but whilst Burnley dominated the early stages territorially Prestwich were organised and defending well and Keeper Mike Hudson wasn’t being called upon to make anything other than routine collections. As the game progressed Prestwich started to get more and more of a foothold, the narrow three in midfield of Mike Neary, Matty Brennan and Tito Miguel started to take control of the game, ably supported by Rafal Straszewski and Dave Thomson dropping deep to help out they dominated the central areas constantly on the look out to either break free themselves or find that killer pass to Sean Haslam foraging as the lone front man. They came so close on several occasions to slipping Haslam in but the passes never seemed to be quite weighted correctly and hence were either intercepted or ran out of play due to the strong wind towards the Burnley goal. That was until the 21st minute when Miguel beat a couple of players and played a perfect defence splitting ball to Haslam who showed tremendous composure to beat his man and round the keeper and slot it into the empty net. Buoyed by the goal Prestwich took control of the game playing less on the counter and enjoying much more possession in the opposing half, several more chances came and went with Neary and Miguel both prominent but it remained 0-1 at the interval. With the wind behind them Burnley made the expected push forward on the restart and Prestwich had to withstand a prolonged spell of pressure, the back line of Dillan White, Steve Lorenzini, Richard Steadman and James Barlow held firm but it was a co-ordinated team effort with everyone digging in scrapping for every ball leaving Haslam to work a prodigious shift as the lone front man. As the half wore on Burnley became more and more frustrated and Prestwich’s counters became more and more frequent and it came as no surprise when the lead was increased in the 75th minute. Mike Neary picked the ball up wide right midway up the Prestwich half and played a long ball down the right hand channel to Haslam. With Burnley light at the back Haslam beat his man and bared down on the keeper from a tight angle on the right, the keeper crudely forced Haslam back out wide with a challenge that looked a penalty all the way, but Haslam managed to keep on to the ball turn the keeper and somehow slot it past a retreating defender into the net for a terrific individual goal. Burnley rallied and put Prestwich under intense pressure in an attempt to claw something out of the game with crosses raining into the box, and on the 80th minute Hudson was called upon to make two wonderful back to back saves, shortly followed by a superb goal line block by Brennan. 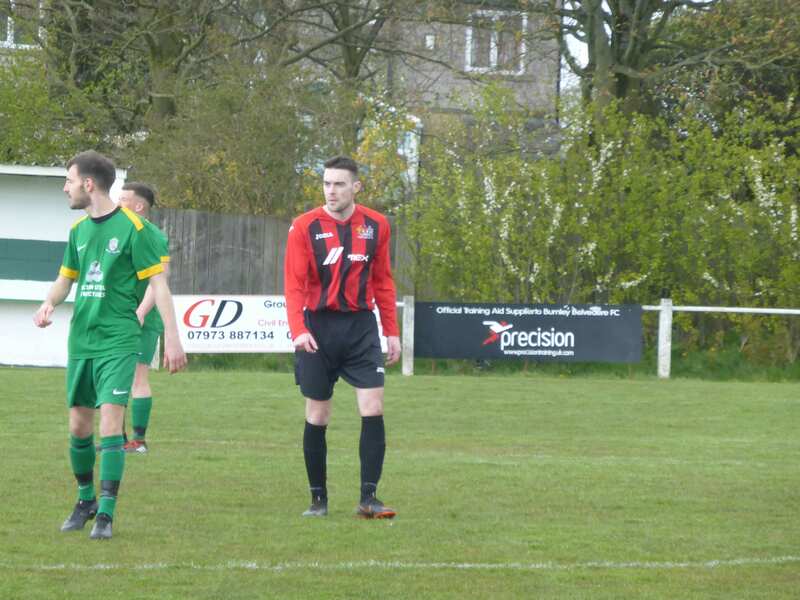 But Prestwich held on to claim the points in what given the circumstances with a bare eleven squad was ultimately was one of most impressive overall team performances of the season.